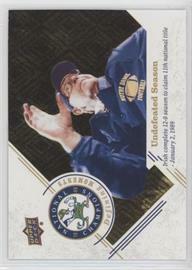 One of the worst products to hit Upper Deck ePack. 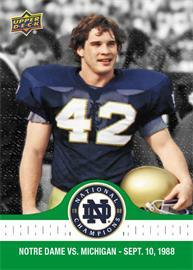 Base cards look boring and limited appeal, even for Notre Dame fans. This e-Pack is a flash back to the past with a brand new trading card set commemorating Notre Dame’s famous 1988 undefeated Championship season. This is an all new 100-card base set chronicling all 12 victories for Notre Dame on their road to the 1988 National Championship. 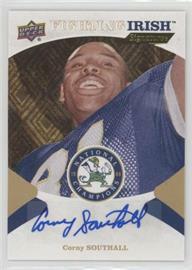 Find some of you favorite marquee moments with Defining Moments inserts or collect the individual players that made them possible with South Bend Standouts inserts. Find autograph cards featuring your favorite players from the 1988 team with Fighting Irish Signatures cards falling 1 per box, on average. Collect and combine 10 copies of any individual digital Base Set (#1-100) card on Upper Deck e-Pack to receive an e-Pack exclusive Blue Pattern Rainbow Parallel of that card with the ability to have the physical card mailed to you. Be sure to check out the achievement cards page for info regarding additional achievement awards for this product. Packs containing memorabilia cards may contain less than the stated number of cards per pack.